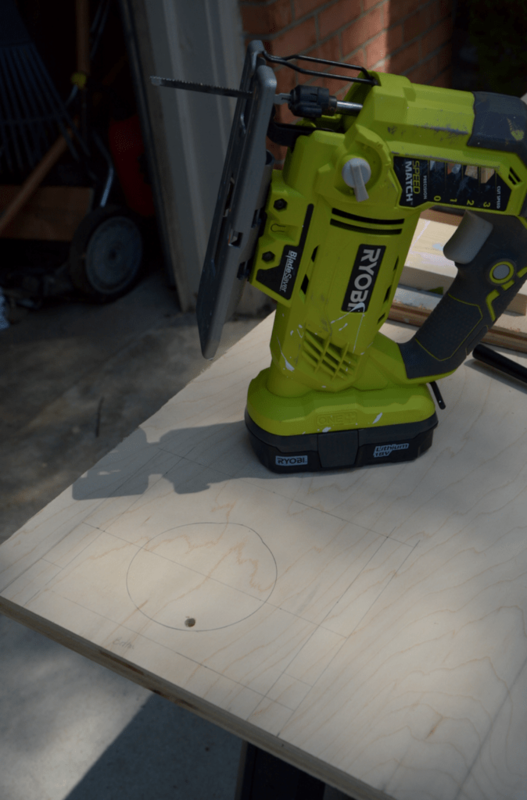 Every month Wendi has a Power Tools Challenge and every month I say I’m going to participate, but then totally flake out. This month, however, I knew I wanted to make this. And of course, we were restricted to using only ONE BOARD. And I totally just did. 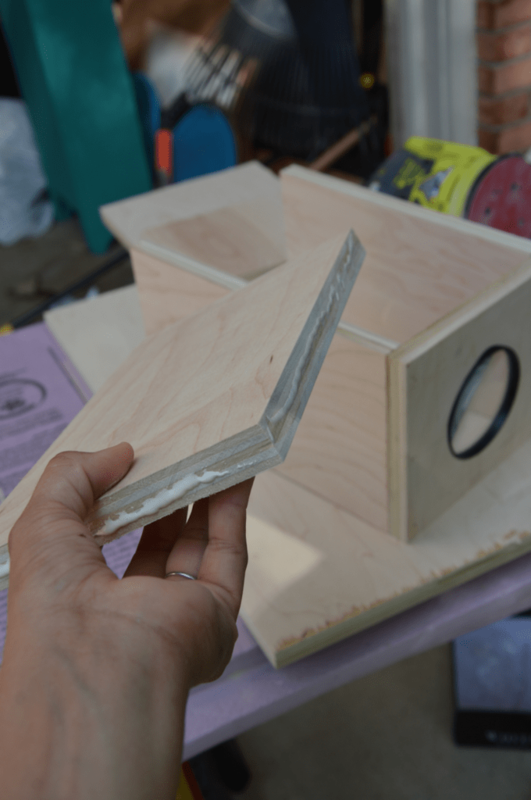 I started with this piece of 2′ x 4′ birch plywood that I just happen to have sitting in my garage from another project. 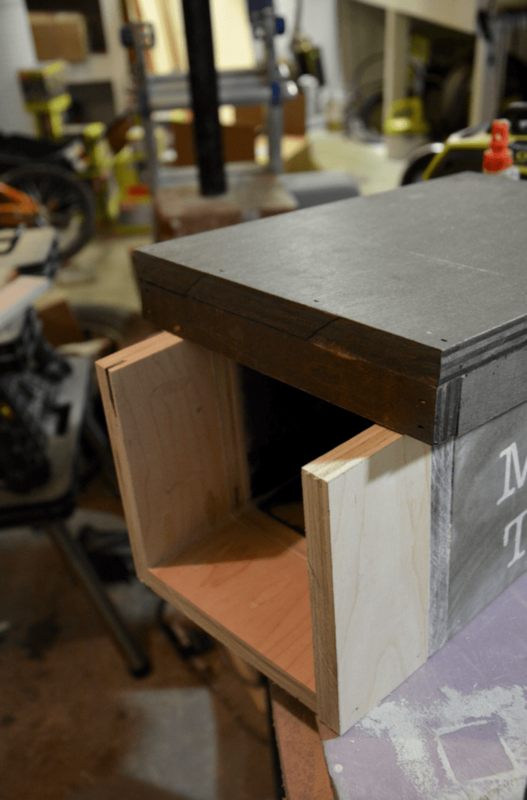 It only cost me about $12 from The Home Depot because it was part of a larger 4′ x 8′ sheet of birch plywood that was cut into 4 pieces when I bought it last month. I was making this on the fly so I didn’t know what measurements I would need. You’ll have to figure out your own measurements, too, because I think it depends on the strength of the magnifying glass. 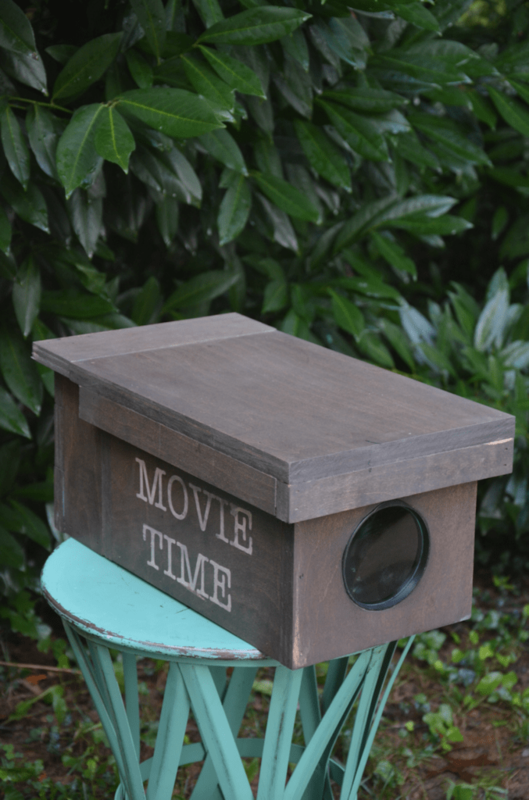 For the one that I used from the Dollar Tree, I had to make my DIY movie projector longer than a standard shoebox in order for it to focus properly. 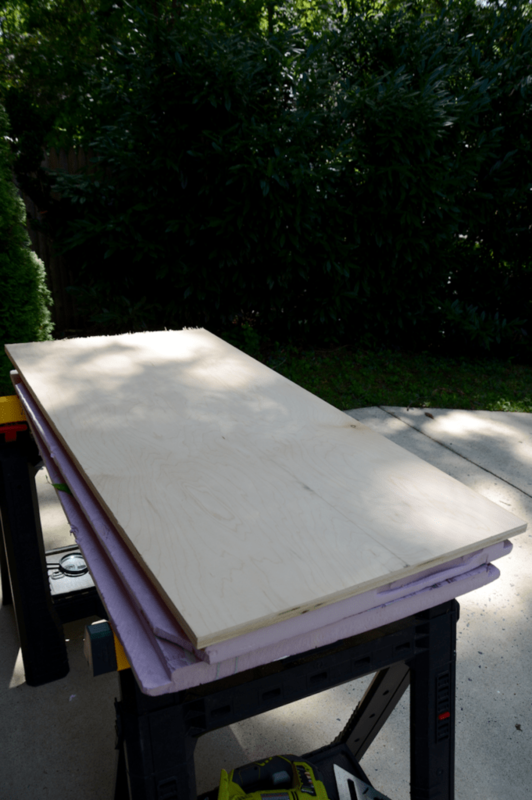 STEP 1: Grab a 2′ x 4′ board. I ended up using the whole thing, surprisingly! Home Depot sells 2′ x 4′ boards by themselves, but they’re more expensive at about $20 or so. My advice would be to have them cut down a larger 4′ x 8′ board, which is $50, but overall, you get more pieces for cheaper! 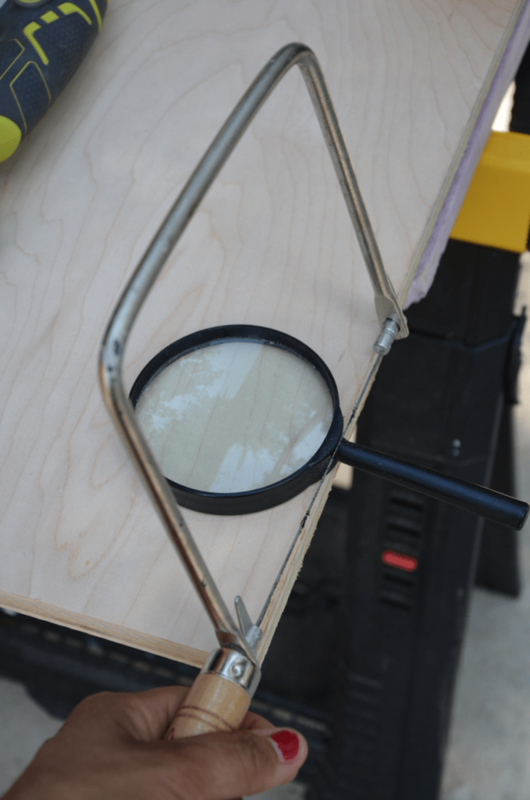 STEP 2: Measure the front, and trace the magnifying glass. 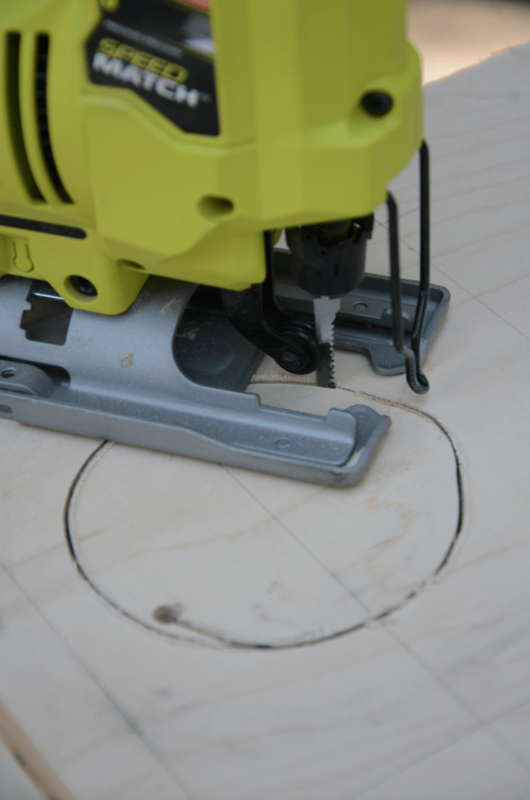 Decide how big you want it and then measure, draw lines, and cut. 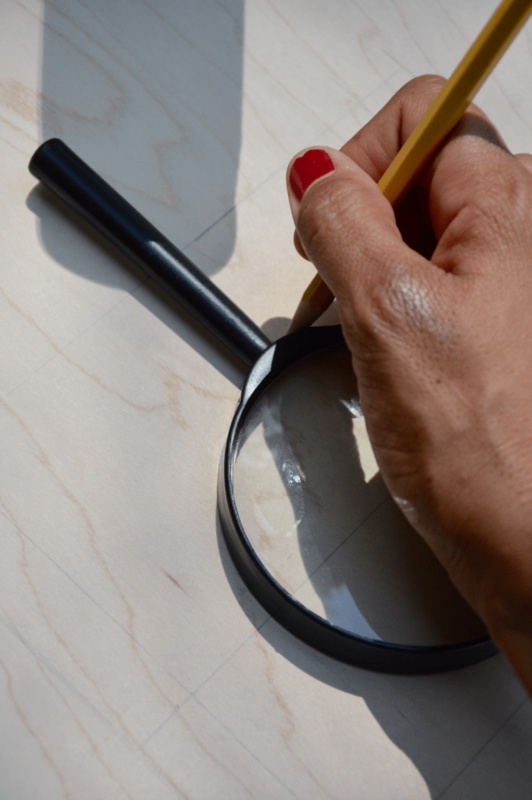 STEP 3: Cut the handle off of the magnifying glass. But this is where a little hand-held hacksaw comes in handy and is easy to do. STEP 4: Begin cutting out the magnifying glass. Here you can see that I’ve got the lines drawn for the size of the front that I want it to be (just about 7 inches).It’s best to cut it out when it’s a solid piece of wood because it’s more sound and easier to cut. 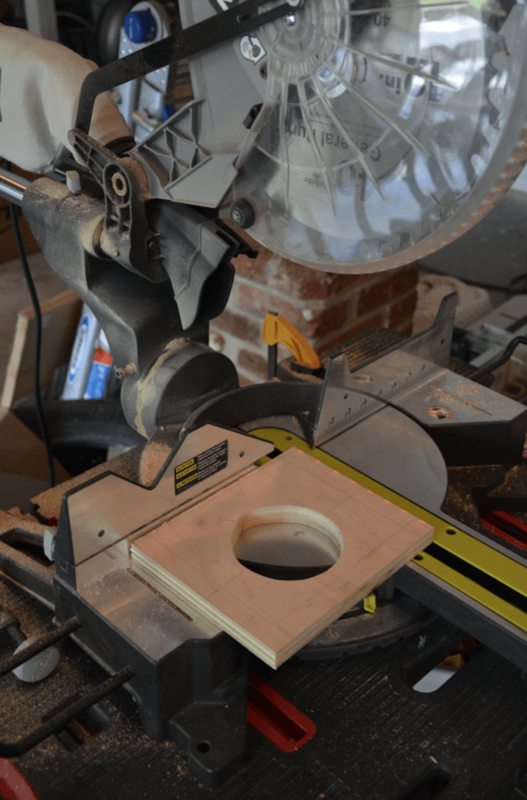 And it’s best to cut it out when it’s a solid piece of wood because it’s more sound and easier to cut. 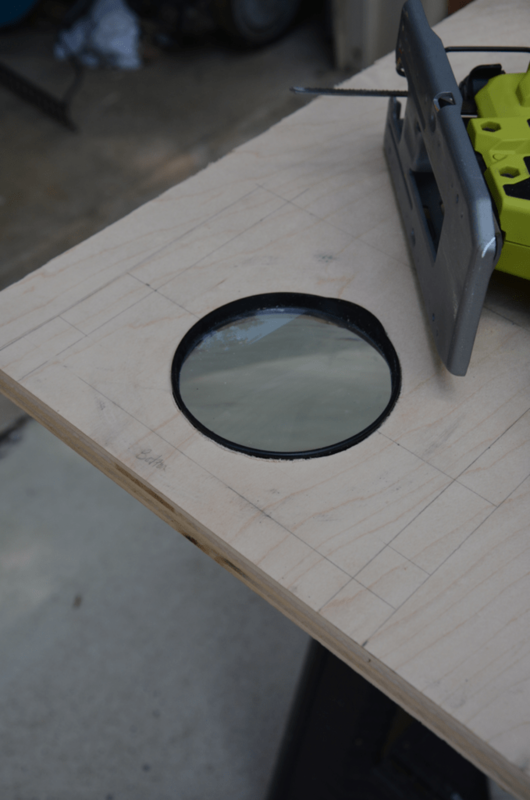 Once the hole was cut out, I tested the magnifying glass in there. You might have to clean up the edges so it fits. Just don’t cut it too wide or else it won’t fit and light will escape! 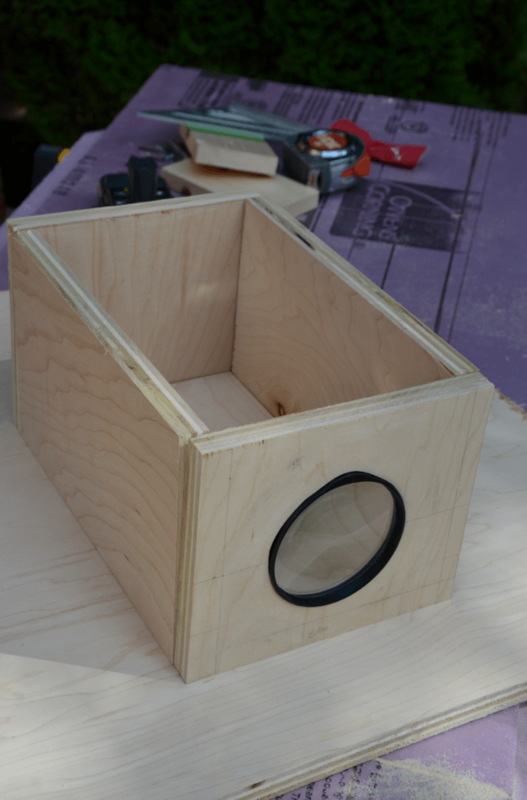 After the glass was tested and fitted, then I cut the rest of the front part of the DIY movie projector using my miter saw. 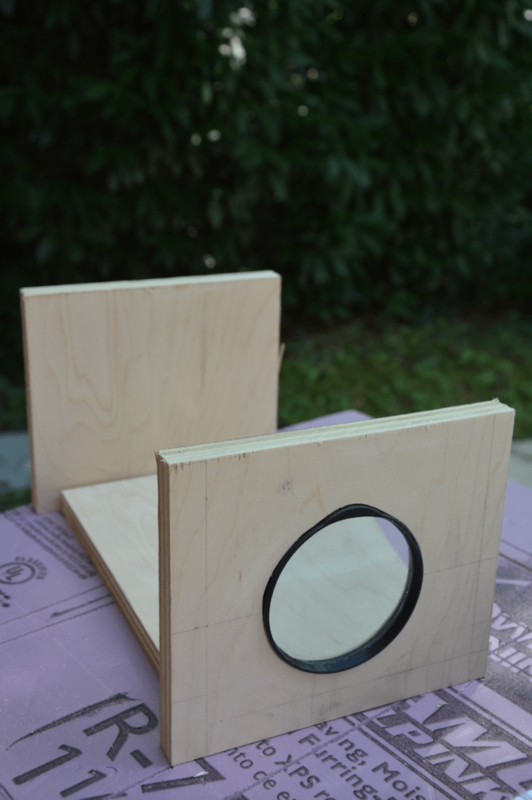 STEP 5: Measure and cut the other pieces. You’ll also need two sides, a bottom, and a back. But before you cut it out, I highly recommend you test to see how long you’ll need it. 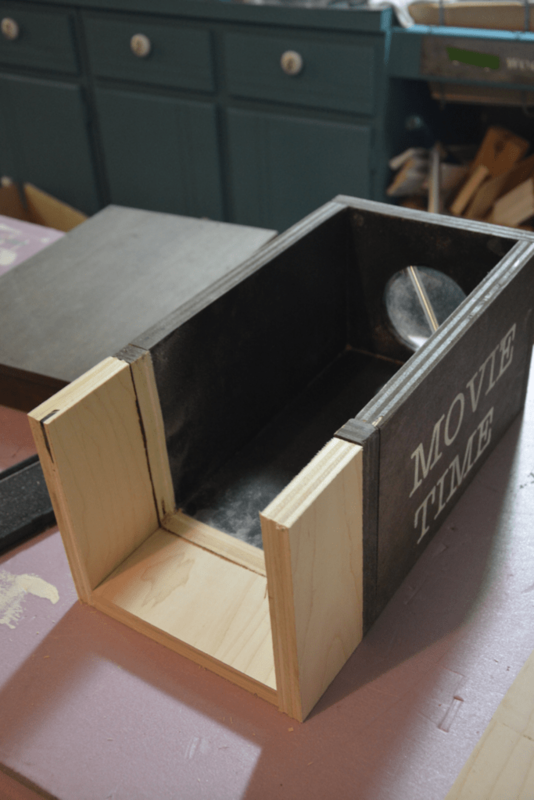 Try using a shoe box just to see how long your DIY movie projector box will need to be before you cut out the other pieces. Take note of these measurements. STEP 6: Glue and nail together. 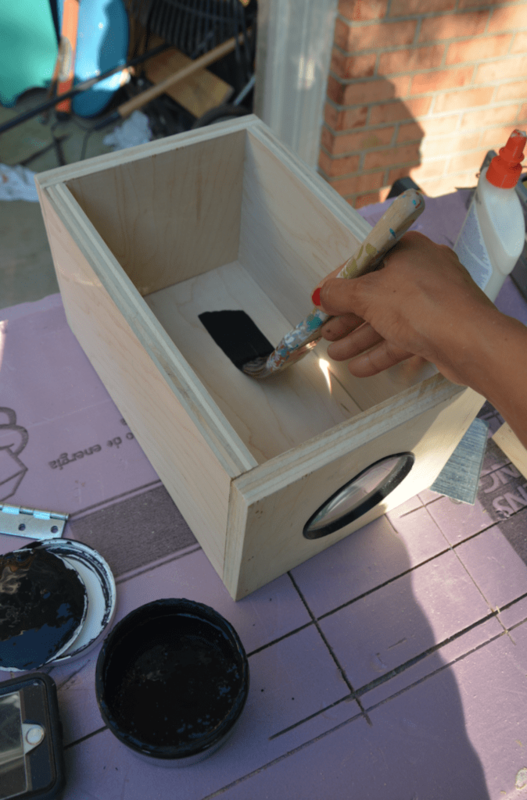 STEP 7: Make a lid. 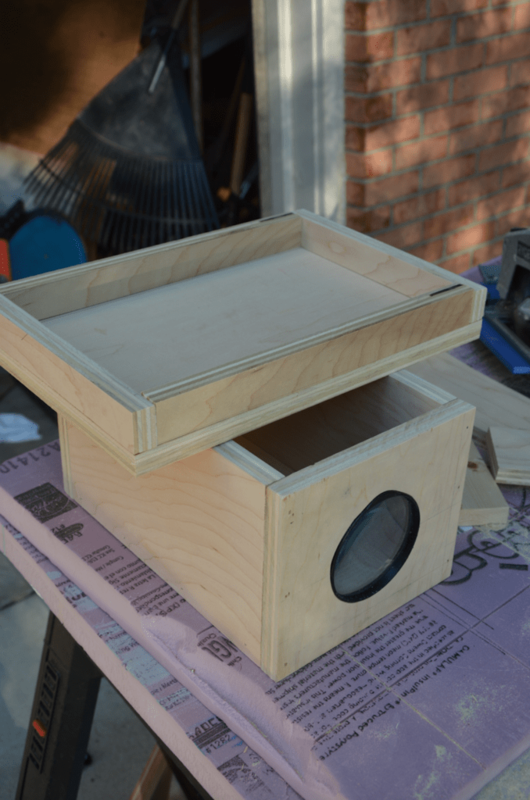 STEP 8: Paint and stain it. 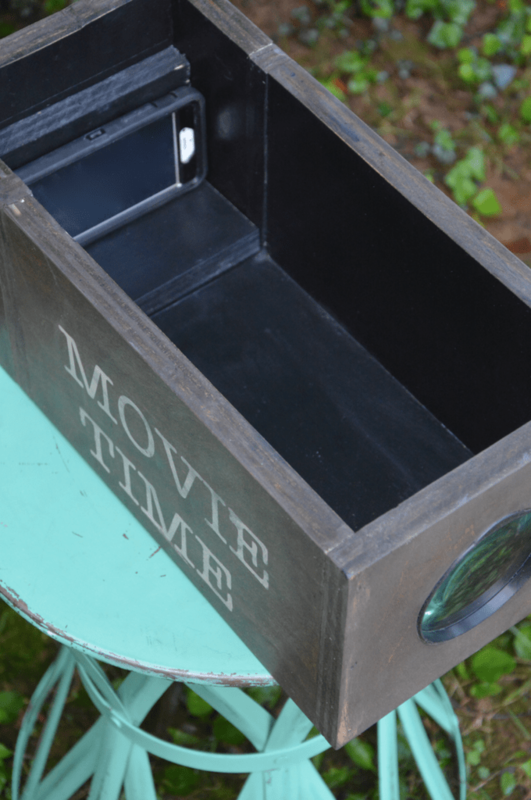 I used black paint inside to keep it dark, and I used stain for the outside, and added some stencils that stay “Movie Time”! Soooo….this is where I failed. I didn’t do earlier testing to see how long to make the body. And of course, it totally failed on me! It actually needed to be longer. Here’s what it looked like when I was done. Well, the body wasn’t long enough for the picture to be seen clearly on the old vintage movie screen I bought at the thrift store. 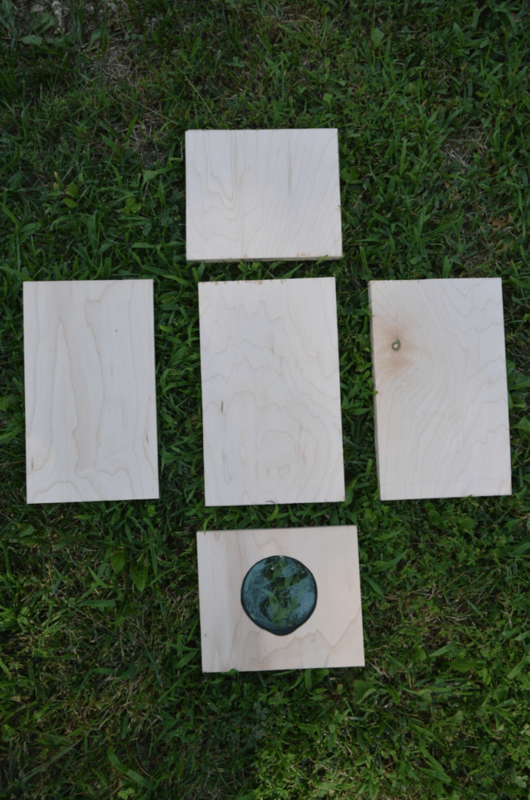 So I had to scrounge up some scrap boards from my 2′ x 4′ (I was not going to cheat and use extra boards! LOL). I created extra space on the back. But as you can see, the lid was too short. After a long time, when all was said and done, I had what was a piece-mealed DIY movie projector! 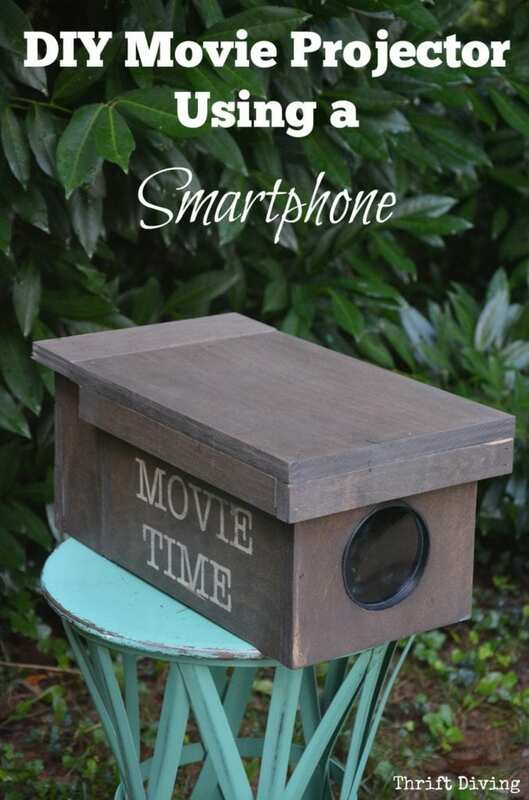 TIP #2: Make sure you LOCK your screen rotation, and you must have the movies on your smartphone flipped upside down. When the image hits the magnifying glass, it will turn the picture right-side-up onto your white sheet, wall, or movie screen. TIP #3: Once you’ve figure out how far away your phone needs to be in order for it to be seen clearly, walk yourself and the projector back and forth until it focuses on the screen. 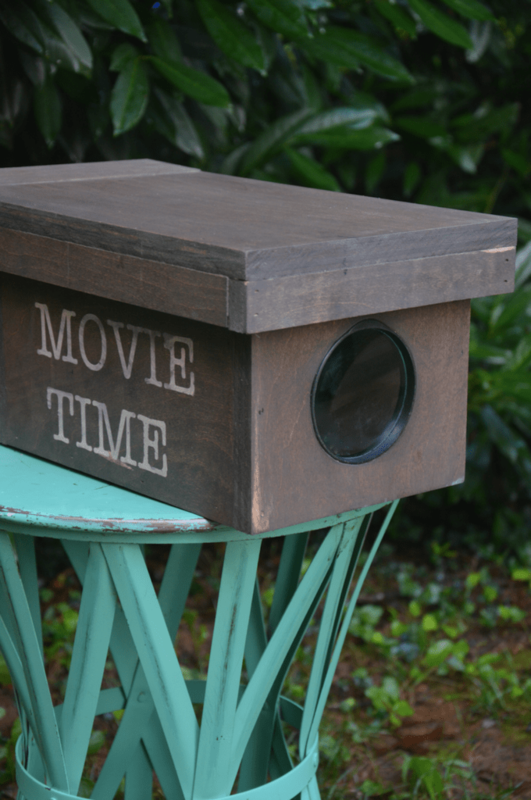 A DIY movie projector for about $15! I consider this my practice one. The next one will not be restricted to gluing random scrap pieces of ONE BOARD together. HAHA! And it would be more colorful, maybe with stencils! But this isn’t bad for a first try! Go See Everyone Else’s Projects! « Look What We Found: It’s National Thrift Store Day! My inner nerd is in trade… How exactly does this work?! Like how does the picture go through the magnifying glass to show up on a wall? This is cool. What did you do for sound? This is so clever! 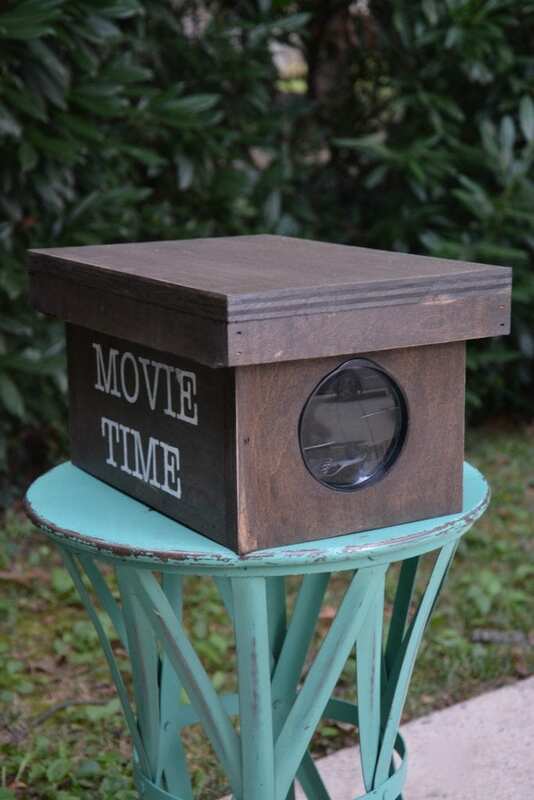 I’ve made a projector out of a cardboard box before, but your version is so much better & nicer! Thanks for linking up with Merry Monday last week; I chose your project as my Host Pick for this week. Our party goes live at 9pm EST tonight and we’d love to have to link up again! What an awesome idea! I didn’t know this was possible, and it’s much less expensive than a movie projector. Thanks for sharing! I’ve been wanting to figure out a way to have an outdoor moving showing, but just couldn’t bring myself to buy a projector. LOVE this idea so much. Thanks for the directions! This is awesome. I did not know and I am going to make one for sure. Thank you for sharing at DIshing it and DIgging it link party. Thanks for coming. This is such a great idea! Thank you so much for making a tutorial. I will be sharing this with my husband so we can incorporate this into our upcoming backyard remodel ??? ?